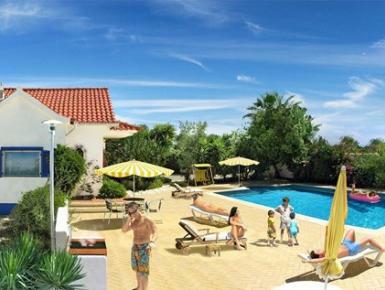 Set in a quiet location, amidst acres of orange groves near the Gilao River and Natural waterfalls at Monihos da Rocha. The villa is situated 3 km north from the centre of Tavira, one of the Algarves loveliest towns, which although popular, has retained its ancient architecture and tree shaded squares. The villa is ideal for a family or golfing group seeking a relaxing holiday. From a tranquil base, there is much to enjoy. Cultural strolls around Tavira, or ferry boat trips to fantastic beaches on offshore islands. Leisurely drives through the countryside or jaunt across the border to savour the Splendour in Seville. A trip to the main town of Tavira, a historic tuna fishing port, is a must. Tavira is one of the Algarves oldest and most beautiful towns. Its a quirky gem with a hilltop castle, 39 surviving churches and chapels, jumbly houses, towers, medieval battlements and famous roman bridge.